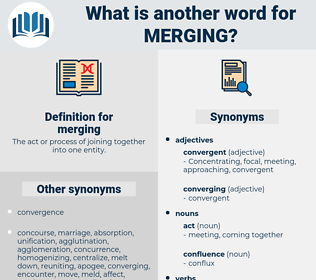 What is another word for merging? The act or process of joining together into one entity. reunification, Fusing, Pooling, clustering, integration. 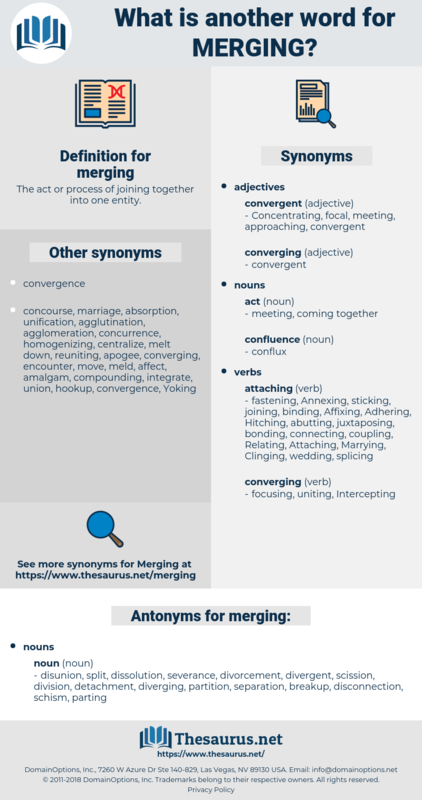 converging, reintegrating, reconciling, Bridging, Consolidating, standardizing, embracing, intertwining, assembling, reconvening, summarising, connecting, Comprising, centralizing, engaging, Concentrating, representing, encompassing, recasting, compiling, Marrying, joining, misunderstanding, bringing, convening, Embodying, Collapsing, showcasing, Associating, reunifying, confusing, Describing, Enrolling, collecting, Forming, Blurring, Collating, locating, Involving, stirring, Consisting, enabling, Containing, Linking, Annexing, featuring, weaving, Attaching, binding, Teaming, raising, Securing, aligning, covering, rallying, two, combing, crowding, parts, matching, Totalling, focusing, taking, Parties, blending, Pooling, clustering. merger, mergers, amalgamation, amalgamations, melting, fusion. merger, Melding, amalgamation, regrouping, Conflation, aggregation, melting, meltdown, incorporation, fusion. Incorporating, Coalescing, uniting, fuse, regrouping, melting. disunion, split, dissolution, severance, divorcement, divergent, scission, division, detachment, diverging, partition, separation, breakup, disconnection, schism, parting. The curious mixture of the actual and the unreal, the merging of wholly different ideas in one conception, so frequent in dreams, are described with extraordinary skill and delicacy. For months each provincial junta seemed to prefer the continuance of its own authority to the obvious necessity of merging all their powers in some central body, capable of controlling and directing the whole force of the nation; and after a supreme junta was at last established in Madrid, its orders were continually disputed and disobeyed - so that in effect there was no national government. marasmius, marasmus, marchioness, myrsinaceae, murkiness, march king, moroseness, march equinox, marching, Mary Harris Jones, marking.